Look, I get it. For me, wine is not intimidating. My seventeen years of exposure to wine language doesn’t really rock my gourd anymore. Sometimes people like my wine picks and sometimes people don’t. I’m here to tell you, that’s okay! Scientifically speaking, we all have varying degrees of taste abilities and what we perceive or what tastes we like really varies from person to person. The fun of wine, however, is the options, the fingerprint of history, and the magic that can radiate from a glass. 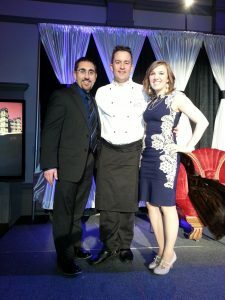 In 2015, I was acting sommelier for the WPSU Annual Connoisseur’s Dinner featuring Chef Paul Brooke-Taylor, the chef at Highclere Castle in which Downtown Abbey’s television series was filmed. 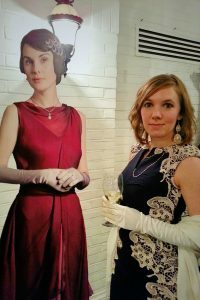 This dinner also featured Downton Abbey’s on set Food Stylist, Lisa Heathcote in an overall wine and dinner theme, “An Evening at Downton Abbey.” Dinner selections and their matching wines were themed to give guests a real-life Downton Abbey feel. During cocktail hour, which featured a range of themed hor d’oeurves, I selected two New World styled wines: Louis Martini Cabernet Sauvignon and Ferrari Carano Fume Blanc. To emphasize the Downton Abbey theme, both Fumé Blanc, a stylistic version of Sauvignon Blanc originating in America, and Cabernet Sauvignon are traditional grape varieties grown in Bordeaux, the wine region of choice for the elite in the early 1900s.. Additionally, their selection was based on the context in which these wines would be consumed. 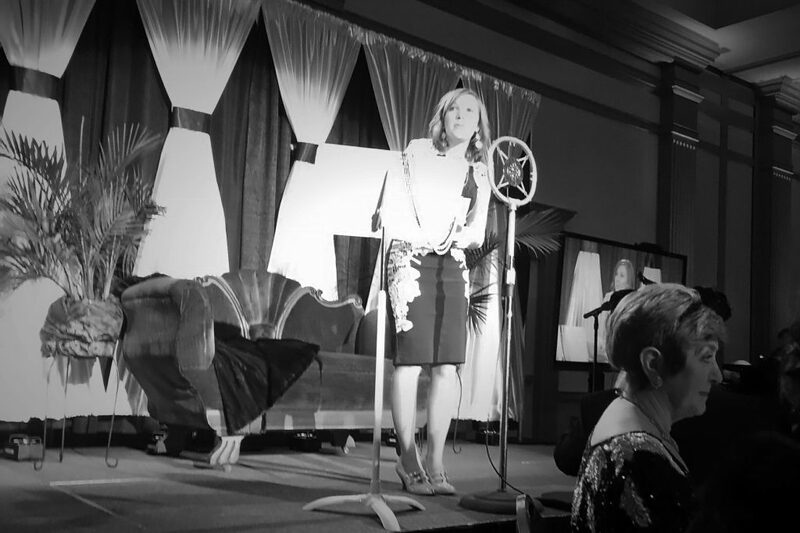 From my previous experience at the event, I knew guests would need wines that could be enjoyed even if they chose to refrain from hor d’oeurves. These wines had to be, what I consider, social wines. Both of these California-produced selections offer these advantages: low acidity, smooth mouthfeel, recognizable varietals, and good perception of fruitiness. Every-Day Wine Lover (EWL) Explanation: As a general rule of wine and food pairing: when in doubt, choose Champagne! Why? Because Champagne can pair with almost anything. Its bubbles elevate most sensory characteristics associated with the meal, and do not overpower delicate or nuanced food dishes. More Detail: For our first dinner course I selected a wine that always dazzles the crowd and palate: Piper-Heidsieck Champagne from Reims France. While Champagne is a great way to get an evening or event started, there was a second, Downton Abbey-themed reason for this selection! For those Downton Abbey fans, you’ll recall that the opening episode for the series rested around the sinking of the Titanic and fellow family members lost in the tragedy. Piper-Heidsieck Champagne was actually served to the elite on the Titanic during its maiden voyage, hence its tie to the show. EWL Explanation: Even though white wines are often paired with fish, I used the Claret, red wine sauce as my inspiration for this meal. I prefer to match the sauce with the wine selection, and hence, chose a traditional Claret blend. More Detail: Claret is an English term for red wines generally produced from the Bordeaux region. Therefore, for this entrée, even though it was fish, I matched the claret reduction with the wine and used a Pennsylvania-produced 2012 Cabernet Franc Reserve from Penns Woods Winery. I thought a selection from the U.S. that represented an Old World wine style characteristic of Downton Abbey’s time would be a memorable experience for guests. The acidity and aromtic complexity associated with Old World wine styles often makes them fantastic food pairing wines. 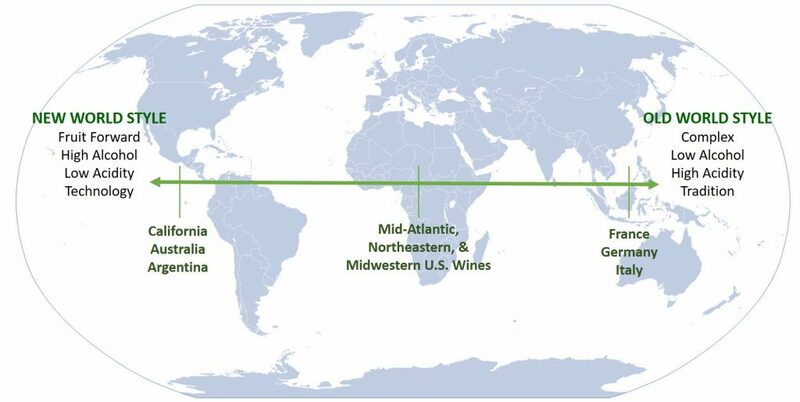 Pennsylvania’s wine growing regions, while they are technically within a characterized New World region (the United States), emphasize characteristics that fall somewhere between New World and Old World styles. As Pennsylvania wines tend to fall closer to the Old World style on the spectrum, I like to use them as unique food pairing wines and broaden the depth of consumer experiences with unique wines. EWL Explanation: When there are so many options associated with a meal, revert back to the main entrée. Here, I matched the gamey venison with a lighter-bodied red wine, Gamay, produced from the Beaujolais region in France. More Detail: Woah! There is a lot going on here in this dish. Mashed potatoes, caramelized parsnips, mushrooms cooked in a brown butter sauce all topped with a juniper sauce. Lots of texture, flavors, and taste sensations! For this meal, I went back to the star of the show: the venison. Here, I chose a 2011 Cru Beaujolais produced by Louis Jadot. Beaujolais is often associated with Beaujolais Nouveau here in an America. But Beaujolais Nouveau is very different in style and taste than a vintage Beaujolais wine. Named after the region in which it is produced, Beaujolais is made up of the red wine grape, Gamay and creates a refreshing, red-fruit flavored wine that is generally lighter in its texture and mouthfeel compared to wines produced in the Bordeaux region. This lighter bodied wine, I suspected, would complement the soft, juicy nature of the roasted venison and pair well with the gaminess associated with venison meat. EWL Explanation: Always choose a dessert wine that is sweeter than the dessert itself. When the dessert is composed of fruits, sweet, rich white wines, like Moscato, can be a delightful pairing. More Detail: Also a lot going on for dessert with so many options that guests could taste. However, the tie in these desserts all revolved around fruit. Therefore, I selected a fruity, slightly bubbled sweet wine for dessert: Saracco Moscato D’Asti. Many consumers don’t realize that wine produced from Asti is actually a slightly bubbled version of Moscato. Fresh, fruity, lively, and always ends with a sweet kiss. I like using Asti as a food pairing option because it is, again, an Old World wine indicating that its natural acidity and vibrancy provide it with the general wine structure needed to make a good wine pairing. Additionally, this tied in with the theme as Downton Abbey is associated with an Old World region of Europe. As with all dessert pairings, it’s essential that the wine is always sweeter than the dessert itself. Otherwise, the sweetness associated with the dessert will overpower the wine, leaving it to taste sour and bitter during the actual dinner. When all was said and done, this was one of my favorite themed-dinner events that I was able to choose wines during dinner. It was fun to have a plethora of Old World options that would have been similar to the wines consumed during Downton Abbey’s time – wines that many wine drinkers are not as familiar with today. This gave me an opportunity to open the door to new possibilities that they may try later. Remember, the fun in wine is trying new things you may not have tasted before!